NETWORK FINALS: There were no changes from the preliminary ratings. CABLE HIGHLIGHTS: AMC’s FEAR THE WALKING DEAD continued its decline, down 0.13 to a new low 0.83, with TALKING DEAD (which aired at 11PM last week after PREACHER) up 0.05 to 0.30. Starz’s POWER fell 0.14 from last week’s season premiere to 0.64. 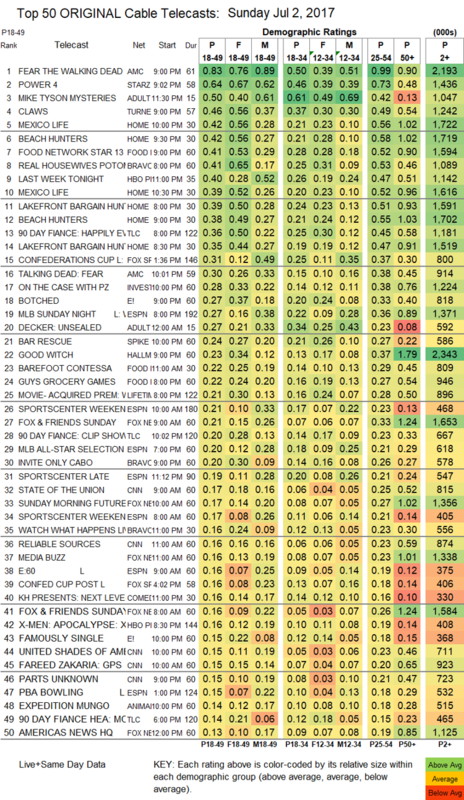 On Adult Swim, MIKE TYSON MYSTERIES lost 0.05 to 0.50, and DECKER: UNSEALED was down 0.06 to 0.27. TNT’s CLAWS rose 0.07 to 0.46. HBO’s only original show of the night was LAST WEEK TONIGHT, down 0.11 to 0.40. Hallmark’s GOOD WITCH dipped 0.02 to 0.23. HGTV’s many Sunday shows were led by BEACH HUNTERS at 0.42, up 0.02 from last week. 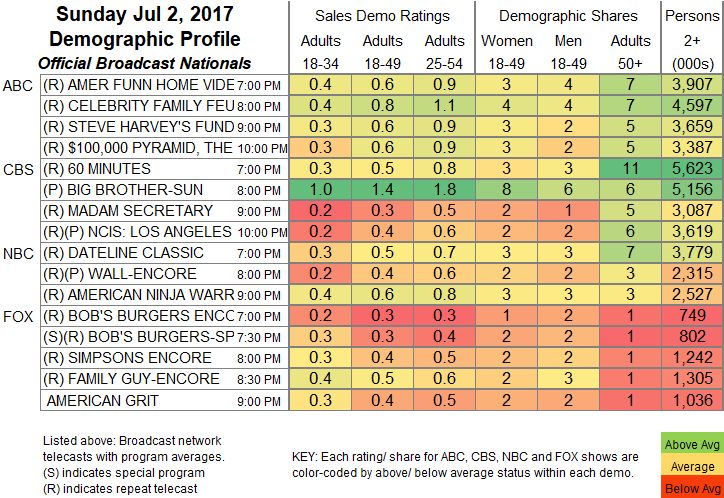 On Food Network, FOOD NETWORK STAR ticked up to 0.41, and GUY’S GROCERY GAMES was down 0.07 to 0.22. On Bravo, the season finale of REAL HOUSEWIVES OF THE POTOMAC was at 0.41, and INVITE ONLY CABO was at 0.20. TLC’s 90 DAY FIANCE dropped 0.13 to 0.36. Fox Sports 1’s coverage of the CONFEDERATIONS CUP was at 0.31. ID’s ON THE CASE WITH PAULA ZAHN slipped 0.02 to 0.28. On E!, BOTCHED shed 0.02 to 0.27, and FAMOUSLY SINGLE dropped 0.05 to 0.15. Spike’s BAR RESCUE was at 0.24.